I write a lot about people who have encounters with anomalous things. This means searching for information on the internet, multiple trips to various libraries, digging up old newspapers and contacting people by email or phone. Rarely do I just stumble across someone in my everyday life that has had an anomalous incident, so I was surprised when somebody I work with told me they encountered a rare electrical phenomenon called ball lightning. Reports of ball lightning have been around for hundreds of years. 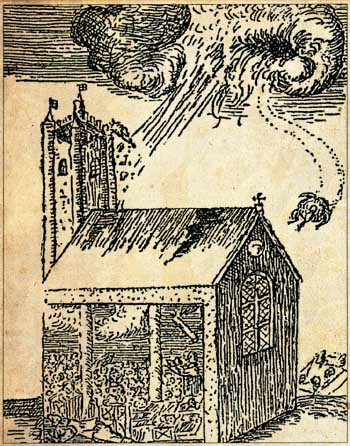 In 1638 an exceptionally powerful thunderstorm struck the town of Widecombe-in-the-Moor, Devon, in England. Church services were going on when an eight-foot wide ball of fire smashed into the stone building doing heavy damage. The ball divided into two, one part exited by destroying a window and the other disappeared somewhere in the church. Records say that four people died and approximately 60 more were injured. This was a disaster of huge proportions for this tiny community that was blamed on Satanic forces. On the evening of October 8th, 1919, a "ball of fire as large as a washtub floating low in the air" hit the side of a building in Salina, Kansas, tearing away bricks and destroying a window. It then exploded into smaller globes about the size of baseballs. According to a newspaper account, "Some of these balls followed trolley and electric-light wires in a snaky sort of manner and some simply floated off through the air�" The paper also added that an electric switch box across the street was torn open and the transformer inside destroyed, leading to a blackout for half of the town. A woodcut of the incident at Widecombe-in-the-Moor in 1638. Ball lightning nearly destoyed a stone church. Not all incidents involving ball lightning have ended so violently. In 1960 Louise Matthews was lying on her living room couch in her South Philadelphia home when a huge glowing red ball entered the room through a window, though both the sash and the blinds were closed. It then floated by the living room and dining room making a sizzling sound. It apparently then exited the building through a closed dining room window. No damage to either the windows or the house was reported, though Ms. Matthews did report at the time feeling a tingling at the back of her neck. She later found that all the hairs in that area on the back of her head had fallen out. Knowing some of these stories I was very excited to learn that one of the police sergeants at the college where I work (and occasionally teach) had a personal encounter with ball lightning. He agreed to tell me his story as long as I kept his name confidential. The Sergeant's concern for privacy is probably not unjustified. For many years reports of ball lightning were mostly associated with hoaxsters, liars and crackpots. Only recently have people begun to see reports of ball lightning as examples of a real scientific phenomenon. Sgt. Smith's (not his real name) story starts in July of 2007 when he was the third person flying along with the pilot and co-pilot on a KC-135 tanker out of McGuire AFB in New Jersey. In addition being a member of the police department, Sgt. Smith was, and is, a Master Sergeant in the reserves. They had spent that day in a training flight dodging around thunderstorms in the area. The jet was at an elevation of about 2,000 feet and the time was 2 PM. The crew was just about to call it quits for the day when the incident started. "As we were coming down to make a landing we were struck by lightning," he said. "I heard a loud bang, saw a flash and then saw this globe. It came off of the instrument panel. Kind of rotating into a ball." The sergeant described the globe as being about the size of a basketball glowing yellow with bluish and pink tones. According to his account it rolled off the instrument panel, fell to the floor and went skittering down the back of the plane, a distance of eighty feet or so, till it disappeared. Smith noted that it seemed to grow smaller as it moved to the back of the aircraft, but he couldn't be sure if this was an effect of the distance or if the globe's energy was being dissipated into the floor of the aircraft somehow. 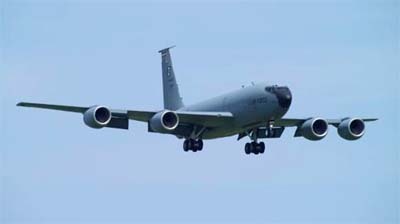 A KC-135 Stratotanker similar to one Sgt. Smith was flying in during the day of the incident. The Sergeant indicated that the entire incident lasted between seven and eight seconds. Beyond the initial bang of the lightning strike he doesn't remember a sound associated with the glowing ball or experiencing the tingly feeling one sometimes gets around heavy static electric charges. When Smith was asked what his initial reaction was to the incident, he said he was thinking, "Wow. What just happened? Cool!" Although Sgt. Smith wasn't aware of what he was seeing at the time, he had heard of air crews who had experienced similar events on other planes. In fact, one of the most publicized incidents involving ball lightning took place in a Russian passenger liner in 1984. 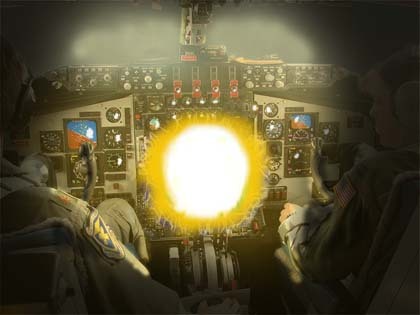 The crew saw a glowing ball of light four inches in diameter in front of the plane. It disappeared with a bang, and then reappeared in a few seconds in the passenger cabin. The ball then drifted through the passenger cabin to the rear of the plane where it divided into two crescents. The crescents then merged again and disappeared from the aircraft. When the plane was examined later, a hole was found in the front of the fuselage and another at the tail. One of the reasons that scientists have been so skeptical about the existence of ball lightning over the years is that while on the surface the reports seem very similar, variations in the reported behavior make it very hard to come up with a scientific explanation for the cause. Sometimes the balls last for seconds, sometimes for minutes. Sometimes the globes quietly disappear; sometimes they explode with a bang. "These may seem like trivial distinctions," notes science writer Gordon Stein, "but they cause theorists no end of difficulties. Explanations that will work for a ball one second's duration, for example, cannot account for a 10-second ball." 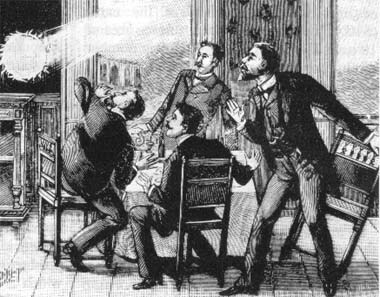 A depiction of ball lightning from the 19th century. Others have argued that ball lightning is simply a misidentification of St. Elmo's fire. St. Elmo's fire is a well-known phenomenon that appears during thunderstorms in which luminous plasma forms around grounded objects like flagpoles, ship masts and church steeples. It's bright blue or violet, but doesn't form balls or roll across surfaces. Smith was familiar with this effect and had observed it in the past. What he saw, he testified, was definitely not St. Elmo's fire. Recently two Brazilian scientists, Antonio Pav�o and Gerson Paiva of the Federal University of Pernambuco have reported some success in creating something that seems to look and act like ball lightning. They think that regular lightning strikes vaporize the silica in the soil, turning it into silicon vapor. As it cools, the silicon condenses into a floating aerosol, which is pulled into a sphere by its charge. The glowing is due to the heat of silicon recombining with oxygen. Experiments in their laboratory involved shocking silicon wafers with electricity, which vaporizes them and creates oxidation in the vapors. The result is small glowing balls which skitter around a surface. I obtained a video of these experiments and showed them to Sgt. Smith who said the movement was very similar to what he remembered seeing in the aircraft. Where would silicon be on an aircraft panel? Well, the electronics certainly contain silicon as it is a primary component in most computer chips. However, it is hard to believe much of this could be vaporized without affecting the operation of the plane. More likely, if this indeed was the cause, some of the rubber-like gaskets and materials on the panel might actually contain silicon, and perhaps some of this evaporated to cause the effect. The video of something similar to ball lightning being made in a Brazilian laboratory shown to Sgt. Smith. So is the mystery of ball lightning solved? Maybe not. The oxidizing silicon vapor might explain incidents like Sgt. Smith's but does it explain some of the more violent incidents sometimes reported? Is there more than one explanation for this effect? In any case, when queried about how he felt about his encounter, the Sergeant replied, "It was an awesome experience. I wasn't freaked out about it or anything." I can't say that I'd be that calm after such an encounter, epecially after reading about the exploding church at Widecombe-in-the-Moor.